Acknowledged author Frank K. Reilly wrote Investment Analysis and Portfolio Management (with Thomson ONE - Business School Edition Finance 1-Year Printed Access Card) comprising 700 pages back in 2017. Textbook and etextbook are published under ISBN 1305262999 and 9781305262997. 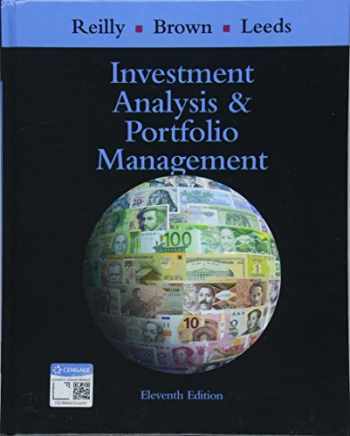 Since then Investment Analysis and Portfolio Management (with Thomson ONE - Business School Edition Finance 1-Year Printed Access Card) textbook received total rating of 4 stars and was available to sell back to BooksRun online for the top buyback price of $84.67 or rent at the marketplace. Learn to manage your money to maximize your earning potential with Reilly/Brown/Leeds' INVESTMENT ANALYSIS AND PORTFOLIO MANAGEMENT, 11th Edition. Extremely reader friendly in a succinct 18 chapters, this text equips you with a solid understanding of investment instruments, capital markets, behavioral finance, hedge funds, international investing and much more. Real-world examples and hands-on applications bring chapter concepts to life as you learn to use the same tools as investment professionals. The 11th edition's unparalleled international coverage provides specific information on non-U.S. markets, instruments, conventions and techniques. New detailed discussions explain the impact of changes in both technology and regulations on global security markets. In addition, three chapters are devoted to derivatives securities--which are now standard investment instruments.